The Hon. 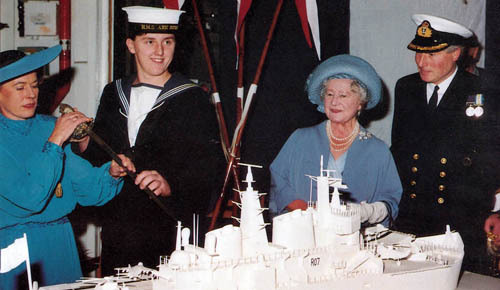 Mrs Jean Weatherall & JMEM Tony "Scouse" McCarthy cut the commissioning cake - 1st November 1985. 27th June - Ark Royal's first Commanding Officer, Captain James Weatherall joins. 28th June - The ship sails from Tyneside. 1st July - Enter Portsmouth, berth Middle Slip Jetty. Remainder of Ship's Company joins. Formal acceptance ceremony on the flight deck. 15th July - Sail from Portsmouth for Sea Acceptance Trials. 20th - 21st July - Visit to Torquay. 22nd July - Commence Safety Operational Sea Training (SOST) at Portland. 1st August - SOST complete. 24th - 26th August - Portsmouth Navy Days. 9th - 13th September - Royal Navy Equipment Exhibition. 1st - 25th October - Sea Acceptance Trials. 1st November - Commissioning Ceremony in the presence of Her Majesty Queen Elizabeth the Queen Mother. 4th November - Sail for continuing sea trials in the Mediterranean. 2nd - 4th December - Souda Bay, Crete.